Mother & Daughter team, Janice & Rosie Hards of Hards PR. 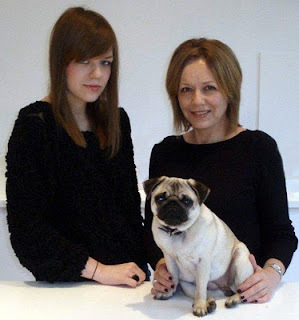 Janice worked in PR for a number of years, starting at Marks & Spencer, before co-founding Hards PR in 1999. Ten years later, it seemed an obvious choice for Rosie to join the business when she finished her Media and Cultural Studies degree at Sussex University. SD: What's the best thing about working together? JH: There's an unspoken trust in each other. We are similar in our attention to detail so I know that whatever Rosie is working on will be done to the highest standard. I would say we have a closer relationship too. And of course, as it's a family business we are working for a common goal. RH: Since working together I would say we have gotten a lot closer. It's nice working with someone you already know and trust and with the business in the family name, we both always have its best interests at heart. JH: It's a 24/7 relationship! Having said that we do have independant lives as well. RH: Probably trying to have two different relationships- a work relationship and a mother-daughter relationship. When she tells me to do something I don't want to outside the office as my mum, I won't do it, or at least I'll make a fuss but inside the office, as my boss, I have to shut up & get on with it! SD: What beauty memories do you share? JH: Having our eyebrows done by the lovely Shavata at her Brow Studio at Urban Retreat, Harrods. Shavata is such a genuinely lovely person and the best in her field. We both had our eyebrows shaped by her before wandering off for a look around Harrods. RH: We go to Center Parcs in Elveden Forest every year for a long weekend and always go to the Aqua Sana Spa. The steam rooms, foot baths and outside pool are so relaxing. We always make time for treatments too and have tried everything from an Elemis facial to Hopi ear candles. SD: Are you similar in your product choices? JH: Yes, in many aspects although I guess I veer more towards anti-ageing where skincare- or anything- is concerned! Not something that Rosie has to worry about for quite a while. Where we are similar we go for a mix of natural and science led products. On the natural side we love Trilogy, Origins and Balance Me (we love the body washes). Science led, we like Crystal Clear, L'Oreal and Strivectin. Max Factor Second Skin Foundation is a particular favourite of us both too. RH: We have different skin types so different skin concerns but we're the same in that we like to use a mix of both natural and science-based ranges. I'm still trying to find what works best for my combination skin so I go through lots of different products. At the moment I'm using Clinique Anti-Blemish solutions range which I really love. The Cleansing Foam and the Clearing Moisturiser are amazing. The one range I always go back to, which we both love, is Crystal Clear. SD: What product do you pilfer from your daughter? JH: Her intensive hair treatments! A few years ago, Rosie bleached her hair but as it is so fine the bleaching dried out her hair and made it brittle so it broke easily. She started using intensive hair treatments to get her hair back into shape. I'd never really bothered with any extra hair treatments other than shampoo and everyday conditioner but seeing the effect they had on her hair tempted me to have a go. SD: And from your mother? RH: I used to take her Bobbi Brown Gel Eyeliner all the time until she got me it for Christmas! Now I take her Origins Ginger Body Scrub and Balance Me Shower Gel whenever I'm having a bath- there's not much she can do about it with the door locked! SD: Any brand discoveries through your daughter? JH: Aussie! The 3 Minute Miracle Reconstuctor in particular (initially bought because of the bleached hair problem) but also their Aussome Volume Shampoo & Conditioner. Volume shampoos and conditioners are a relatively new find. We both have fine hair so this is our new obsession! SD: And through your mother? RH: Yes, she told me about the one product I couldn't live without- Elizabeth Arden Eight Hour Cream. You can use it for EVERYTHING! I especially like using it as a lipbalm and take it with me everywhere I go. Years ago, before I went to Benicassim festival in Spain, she also gave me a bottle of Batisse Dry Shampoo and I've been buying it ever since. It's great for those "I can't be bothered" days. SD: What's the best beauty tip you've picked up from your daughter? SD: And from your mother?RH: She's always told me about the importance of sunscreen since I was very young, especially because I have such pale skin. Being asked to put some on all the time used to drive me crazy when I was growing up but now I can see why she did. Sunscreen is not somethig you should just apply in the summer but something you should be using everyday. Nothing is more ageing than the sun's UV rays. Marks and Spencer has a good range of moisturisers with SPF. I especially like the Formula Age Defence Vitamin C Summer Glow Day Cream, not only does it protect your skin with SPF15 but it gives you a nice golden glow too. SD: What would you change about your daughter's style? JH: Nothing really. Rosie goes for a natural look by day and full-on smoky eye- jet black eyeliner, eyeshadow and mascara- for evening, which has always been my favourite look too. Rosie has a really effortless style which I admire. RH: The only thing I can think of is I would maybe like to see her using a little bit more colour when it comes to make-up but that's something I would change in myself too. We both always go for black and neutral shades but she can apply things like tangerine lipstick and look amazing! It's the same with our clothes too- our wardrobes are over 70% black! SD: It's Mothers' Day today- what are your top tips for a mother-daughter day out? JH: Obvious, I know but there's nothing like a day out shopping! We tend to go off to Bluewater together and stop off at Yo! Sushi along the way round, with Rosie paying! It helps that we tend to like going in the same shops too like Topshop, All Saints and Urban Outfitters. Or other than that- get a dog! Rosie and I have had some lovely walks in nearby Greenwich Park with Poppy, our pug puppy. RH: Bluewater also has a cinema so if something good is on, we might put our shopped-out feet up there! JH: Refreshingly honest reviews with a fresh perspective. I love the eclectic mix of big brands with smaller names that you may not already have heard of. It's always exciting to get the latest post straight to my inbox. RH: As part of our job, we are always on the look out for good beauty blogs and Skin Deep is one of them. I like the mix of news, interviews and reviews that are always interesting, helpful and reliable. It was only a week ago that I ordered Nailease Instant Manicure Varnish strips after reading about them on the blog.